Oluwatoyin Oduntan holds a PhD in History of Dalhousie University, Canada and is currently an associate professor of African history at Towson University, USA. His research focus is on elite formation in Africa, and the intellectual ideas behind the making of modern Africa. He is the author of Power, Culture and Modernity in Nigeria Beyond the Colony (2018) and has published articles on the print media, colonial medicine, and Christian missions. 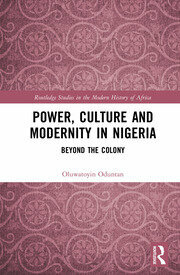 Oluwatoyin Oduntan holds a PhD in History of Dalhousie University, Canada and is currently an associate professor of African history at Towson University, USA. He has previously taught at Obafemi Awolowo University, Ile-Ife, and Olabisi Onabanjo University, Ago-Iwoye, Nigeria. His research focus is on elite formation and the intellectual ideas in the making of modern Africa. He is the author of Power, Culture and Modernity in Nigeria Beyond the Colony (2018) and has published articles on the print media, colonial medicine, and Christian missions.